My favorite fruit is the cherry….the perfect blend of tart and sweet! Cheribundi has elevated the taste sensation of cherries with a delicious variety of juices and tea blends. 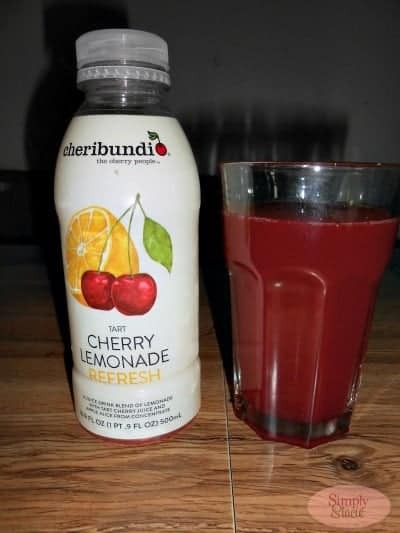 Known for offering premium tart cherry juice, Cheribundi products are very refreshing and hydrating and is made with fresh pressed cherries and not from concentrate. In fact, there are a whopping 20 cherries in each bottle (5 cherries per bottle of Refresh Tea) which is very impressive to me and you can really taste it with the bold, delicious flavors. As a mom I love that this product line does not have any artificial flavors, colors or sweeteners so it is something I can feel good about serving to my husband and children. The newest juices and teas are conveniently available in a generously sized 16.9 oz bottle so it is perfect for on-the-go. My family really enjoyed sampling all of the delicious flavors from Cheribundi including Tart Cherry Blueberry Refresh, Tart Cherry Green Tea Refresh, Tart Cherry Jasmine Tea Refresh, Tart Cherry Lemonade Refresh, Tart Cherry Raspberry Refresh, Tart Cherry Cranberry Refresh and Green Tea with Tart Cherry Refresh and Rooibos Tea with Tart Cherry Refresh. My personal favorites are the Tart Cherry Blueberry Refresh and Rooibos Tea with Tart Cherry Refresh. The Tart Cherry Blueberry Refresh is perfectly tart with a hint of sweetness that really makes the cherry flavor nicely pronounced and absolutely delicious. Combining two of my favorite fruits, blueberries and cherries makes this a delicious beverage that is perfect on a hot day and I like that it contains 25% juice. My favorite tea is made of Rooibos so my favorite tea blend from Cheribundi is the Rooibos Tea with Tart Cherry Refresh. This tea is absolutely amazing and they have managed to expertly combine the cherries and tea in a perfect blend. My six year old daughter wanted me to mention that it is her favorite drink too and since Rooibos is caffeine free a beverage that she can enjoy as well. 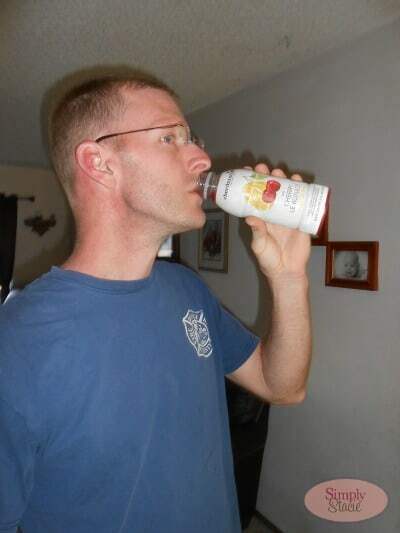 My husband initially said, “I don’t like tart drinks so I don’t want to try it”. I managed to convince him to take a sip of the Tart Cherry Raspberry Refresh and the rest is history. Suddenly, he was asking me if he could have these in his lunch box to take to work or enjoy at dinner with his meal. The verdict……he loves it too! You are invited to visit Cheribundi to learn more about this delicious beverage line and you can even purchase any of the flavors online at their website. A case of twelve bottles retails for $29.99 (Refresh Tea) or $39.99 (Refresh Juice)…..which flavor would be your favorite? I love that the Cheribundi juices provide the great taste of cherries along with other health enhancing ingredients such as added whey protein providing natural rebuilding power for active bodies or electrolytes for energy. I love that they offer a light cherry tart option that has 40 cherries in it! I love cherries and this just sounds beyond delicious! Thanks for the giveaway…food scientists at Cornell University determined that tart cherries eased a regular person’s back pain. I learned that the company is located in Geneva, New York.